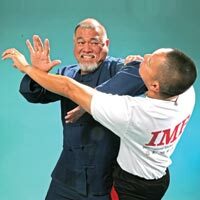 Richard Bustillo met and studied with Bruce Lee in the mid-1960's. The principles, concepts, and philosophies of Lee’s Jeet Kune Do is what Bustillo had always believed in. Bruce made him aware of his personal abilities by understanding his own strengths and weaknesses. It was Dan Inosanto, his training partner, who was instrumental in Bustillo’s continued discovery of his own Jeet Kune Do way and martial arts growth in his "backyard gym" class in Carson, California. Bustillo weeded out the undesirables in the probationary basic class that he taught. When Bruce passed away in 1973, Dan and Bustillo opened the Filipino Kali Academy in Torrance, California a year later because they wanted to share the intensive research we did on the Filipino martial arts of Kali, Eskrima, and Arnis, together with the process of self discovery after studying various martial arts, the process called Jeet Kune Do concepts.